I recieved a message that said Jotform is over quota. This came completely out of the blue, and less than 12 hours later, i received a message that said my account was disabled. Unfortunately, during that 12 hour period I was either in bed or at work, so I did not see either message until it was too late. I tried to get into my account and at first wasn't successful - Just got a couple of disjointed messages. Then it suddenly let me in, so I decided to reduce the memory I was taking up by removing all but my 2 most recent documents. I started deleting them and then discovered that the documents that were getting deleted weren't corresponding to the ones that I was clicking on, and one of the documents I intended to retain was gone! Can I get it back? I have checked your account and I see that your trash folder has been emptied. Do you have the URLs of the forms that you are looking to get back? We would be glad to see if we can help you with this issue. I didn't think to check for a trash folder. Not sure how it could be empty, since i don't even know where it is, let alone empty it. I don't think i've even logged out of JotForm since I did my deletes. At any rate, not sure I would be able to to provide the URL for the specific form. I only know that the immediately adjacent form was http://www.jotform.com/submissions/21337952399161. The other thing I have is the e-mail associated with the form. This e-mail gets sent to me by the system and contains the content of the form, but I can no longer open the attachments associated with the links contained in the e-mail. As an example, one of the links goes this URL: http://s3.amazonaws.com/jufs/lydiafund/21337952399161/214443658411230228/Gavin_testimony.docx. There were 6 other attachments as well. I have checked for the form that you have mentioned on your post and it is still available. You can find it on the menu bar shown bellow. If your forms are deleted, they are sent to the trash. You can retrieve this forms by following this guide. Once you have deleted them from the trash there is no way to get them back. Let us know if this helps or if you need further assistance! I'm not sure what you mean by the form I mentioned being still avaialable. the only form left is http://www.jotform.com/submissions/21337952399161. As for the form i lost, as I stated, i don't know what the URL was. i only know that it was immediately adjacent to the one form that remains. in other words, the lost form was immediately next to http://www.jotform.com/submissions/21337952399161. If the "Grant aplication disclaimer" for is the missing form, you may try clicking in the "All" button on the top of the "My Forms"page. 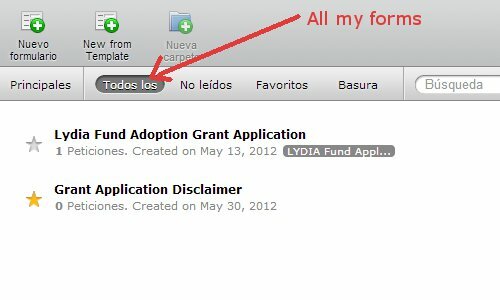 If that is not the missing form, I rergreat to inform you that I was not able to find any other forms on your account. Please let us know if this hleps and/or if you need further assistance! No, the disclaimer is NOT the missing form. The missing form is a grant application form from the Pehl family. We originally had two different application forms... One from the Gregorin family and another from the Pehl family. We still have the form from the Gergorin family (http://www.jotform.com/submissions/21337952399161). We no longer have the form from the Pehl family. So we are trying to retrieve the form from the Pehl family. I don't know what the URL was. I only know that it would presumably have been something similar to http://www.jotform.com/submissions/21337952399161, except the numeric characters at the end of the URL would have been something different. So there is no way to retrieve the form from the Pehl family? 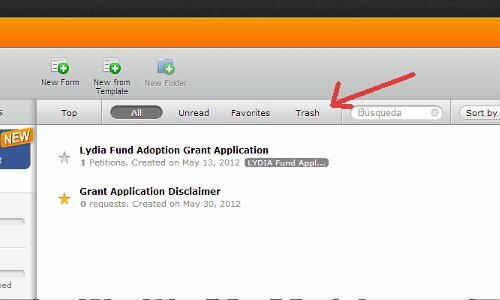 I hate to say this, but we cannot restore deleted form submissions anymore. In the past, we used to do it for customers but it became too labor and time-intensive, so we had to start rejecting restoration requests. I am afraid you will have to ask your applicant to re-submit their application. In addition to what I posted above, I would like to let you know that deleting your form submissions will NOT keep your monthly counts down. If that was possible then there would have been no point in offering paid subscriptions as users can easily delete submissions so they can receive as many as they want. We advise you to take extreme caution when deleting form submissions. As a backup strategy, I suggest that you register a Dropbox account, then integrate your form to it so that you can have a copy of your form applications. OK, thank you for your help. I will have to ask our applicant to re-submit the attachments to the form. I'm still confused regarding the deleted forms, though. I did not empty the trash. I did not even know how to access it at the time. Yet there is nothing in the trash. i see from the JotForm forum that others have had a similar problem. They've deleted things and those things never appeard in the trash. They were simply gone. It does seem like there's some kind of problem there. I have signed up for the upgrade, which I'm perfectly happy to do. But the unusual meaning of Jotform's 100Mb limit was never explained to me when we signed up. The universal understanding of a memory limit in a free product is that the product remains free as long as the memory is MAINTAINED below the limit. Deleting stored data to avoid going over the limit keeps the product free. This is true of any free-e-mail account and many other on-line products. The product providers offer a free version and a pay version. The free version remains permanently free as long as the user is willing to live with the restrictions of the free version. The providers make their revenue off the pay version.